And finally, last but not least, it's the Green party. I know I've already criticised the Lib Dems for their excessively long manifesto, but I feel that the same criticism should be levelled at the Greens. Their manifesto is over 80 pages long, slightly excessive for a party who's raison d’être is protecting the environment. Although, they have also produced a helpful mini-manifesto which outlines their key pledges while, cleverly, missing out some of their more radical ideas that might lose them votes – or that might be me being cynical. If you're looking for a protest vote, radically different from the three established parties, which isn't UKIP, then here it is. Although, they do pledge to increase NHS funding and improve Mental Health provision, just like the other parties. 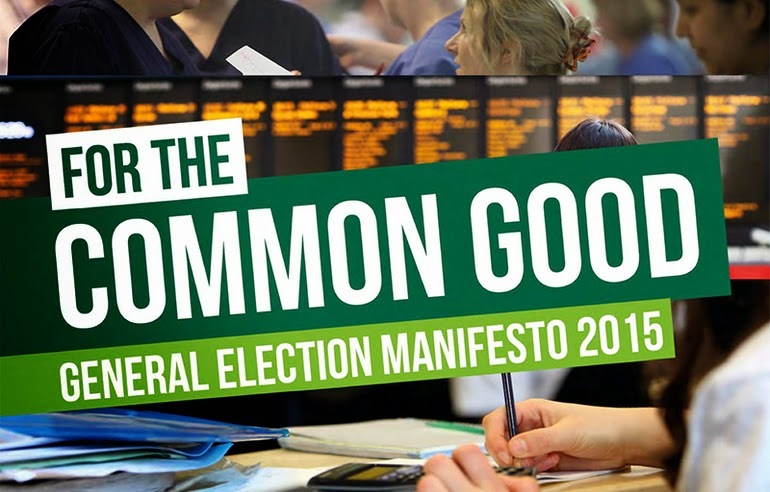 The Green Party are pledging to end austerity and will govern for the common good – treating the British public as citizens not consumers! They say that successive governments have treated the public badly, governing instead for their own vested interests. So first lets look at their economic policies. The Green's pledge an increase in public spending in the region of £150 billion, borrowing more than twice as much as the current government. They'll create more than one million public sector jobs paying the living wage...an interesting proposition considering the squeeze the public sector has been under for years. This will be funded by a wealth tax on the top 1% (those with over £3 million of assets) and introducing a 60p top rate of income tax (which worked so incredibly well in France...), a tax on the banks and, of course, the closure of all those nasty tax loopholes – sigh...if only it was that simple. Interestingly, they also promise to increase corporation tax to 30% – fitting nicely with their anti-big business rhetoric, whilst also inadvertently damaging smaller businesses too. The major problem with all these pledges is there is no way of predicting the revenues they'll bring in. Along with this attempt at economic revolution normal Green Party policies make an appearance. Improved animal welfare, ending the badger cull and all non-medical experiments on animals will all be popular with the animal loving British public. That being said, a review into Horse Racing has raised eyebrows – some even saying the Green's want to ban the Grand National! (One of the things they leave out of their mini-manifesto). The flagship environmentally green policy is the £45 billion home insulation programme. This policy makes a great deal of sense, helping to eliminate fuel poverty, as well as reducing the burden on the UK's energy market. However, the price tag is very prohibitive, especially without the help of private business – the party's arch-enemy. With the help of the energy companies (particularly the Big Six the party want to break-up) this could be a deliverable policy, helping to cut the country's carbon emissions. A pledge to increase the amount of energy from renewables and phasing-out coal power is admirable, but I fail to see how this rapid expansion is possible with an increase in nuclear power in the short term – something the Green's rule out completely. Interestingly, the Green party also promise to scrap the government's flagship “Help to Buy” scheme, something that has allowed new people a leg-up onto the property market – instead they'll replace this with 500,000 new social houses. Whilst the expectation that everyone will have a council house is to be respected, the reality is different, people want to own their own home and the Green's won't change that any time soon. Scrapping tuition fees makes an appearance, as well as reducing the voting age, perhaps trying to solidify the movement of the youth vote away from the Liberal Democrats. They also promise to replace the House of Lords with an elected chamber, but more interestingly they pledge state funding for political parties – something that, in theory, would stop the accusations of parties being in the pockets of their supporters (Labour and the unions & the Conservatives and big business). Overall, the Green party have some good ideas, however they lack realism. Whilst a pledge to end austerity and to significantly increase public spending is admirable, it fails to realise that the spending cuts have worked to improve the economy – hence why Labour has promised more of the same. Their tax increases fail to take into account the failures of France's similar polices, where as their key energy policies are unlikely to work without the help of the big businesses they're punishing severely. The "revolution" to improve the country's governance is unlikely to occur if they turn their back on economic realities.